Skin cancer. Light micrograph of a section through a large cystic basal-cell carcinoma (centre) in skin tissue. Cystic basal-cell carcinoma is a malignant (cancerous) cutaneous condition characterised by dome-shaped, blue-gray cystic nodules (seen here). 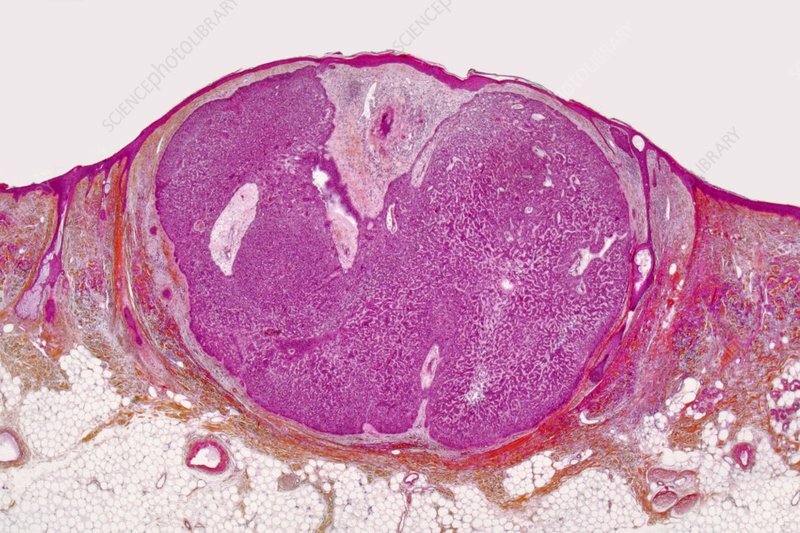 Basal-cell carcinomas rarely metastasise or kill. However, because they can cause significant destruction and disfigurement by invading surrounding tissues, they are still considered malignant. Magnification: x350 when printed 10 centimetres wide.